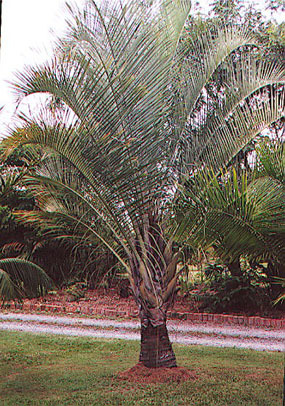 One of the more unique palms in appearance is dypsis-decaryi, Triangle Palm, (formerly known as neodypsis decaryi) because of the arrangement of fronds that form a triangle shape just above the round trunk. This palm is rated for zone 10-B through 11. I have one in my zone 9A central Florida garden that was doing quite well until our recent 2009 long winter freeze. It's still alive, but all but one frond were damaged by the freeze and so it must start over. This is the price we pay when we buy palms that are not suited for our particular area. This palm has a moderate growth rate, growing to 25 feet. It has low salt tolerance, but high drought tolerance once it's established. It has no major pest problems.